Fjallraven Keb Expedition Down Jacket. Scandinavians haven't just lived through cold winters -- they've flourished through them. They've played, explored and embraced the season. It's no surprise that Fjallraven makes the best technical, well-insulated down jacket packed with practical features for countless winter activities. 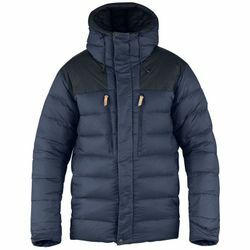 That jacket is the Keb Expedition Down, a technical, traceable-down jacket made from 100% recycled polymide, with double layers of fabric on the shoulders, hood, cuffs and rear and even suspenders that let you keep the jacket "on" without using the sleeves. With strategic pockets, an adjustable hood that fits a helmet and even a repair kit -- Fjallraven's thought of everything with this jacket so the winter won't stop your fun.